Will Trump’s Environmental Protection Agency (EPA) Chief Scott Pruitt Abandon Duty to Protect American Children from Dangerous Pesticides? 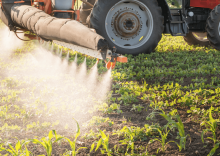 Those pesticides are chlorpyrifos and phosmet, two chemically related insect killers that can permanently damage a child’s developing brain, according to analyses by the EPA’s own scientists. These pesticides persist as residues on some of the most popular foods in kids’ diets. Yet both will likely be used on agricultural crops until at least 2022. One of Pruitt’s very first moves as EPA administrator was an eleventh-hour cancellation of a ban on chlorpyrifos, which had been ordered during the Obama administration. Pruitt overturned a multi-year effort by the agency to address new and troubling evidence that organophosphate pesticides, such as chlorpyrifos and phosmet, are highly toxic to kids. Beginning in the late 1990s, the EPA and the National Institute of Environmental Health Sciences funded several long-term studies of the effects of pesticide exposure on children. By 2011, three studies clearly showed remarkably similar effects of organophosphate exposure during pregnancy, including lowered cognitive abilities of 6- to 9-year-old children born to exposed mothers. The children who participated in those studies are now attending or graduating from high school, but organophosphates are still contaminating fruits, vegetables, nuts, grains and oils. The EPA’s recent health risk assessment for phosmet concluded that children’s health is threatened by current exposures from food. Infants and children ages 5 and younger have the greatest exposures of any age group. The most significant sources of phosmet exposure in children’s diets are peaches, peas, apples, blueberries, milk and contaminated drinking water. But don’t count on any quick action from Pruitt to protect kids from phosmet exposure. Phosmet was last re-registered in 2006, and as with chlorpyrifos, the EPA is required to update its safety assessment by 2022. A lawsuit by advocacy groups compelled the Obama-era EPA to prioritize a quicker review of chlorpyrifos’ toxicity. But as Deputy Administrator Nancy Beck confirmed in a letter to EWG President Ken Cook, the Trump EPA will allow these harmful chemicals on food crops for at least five more years. Another crucial decision on pesticides and kids is looming. When pyrethroid insecticides were developed, they were touted as a safer alternative for controlling insects. But six recent studies find that pyrethroids may pose risks to children’s brain and behavioral development similar to those of organophosphates. This includes permethrin, which the Department of Agriculture has detected on three-fourths of samples of conventionally grown spinach, and which is also used in lice shampoos, mosquito-repellent clothing and other household pest treatments. In one study of more than 600 American children 8 to 15 years old, those with detectable pyrethroid residues in their urine were twice as likely to be diagnosed with ADHD as other children. Biomonitoring by the Centers for Disease Control and Prevention found that children 6 to 11 years old have greater exposures than teens and adults. Exposures to one key pyrethroid metabolite – a chemical formed by the breakdown of the pesticide in the human body – increased by 50 percent in children between 2000 and 2010. This week EWG submitted formal comments urging Pruitt to halt the pyrethroid safety assessment until the EPA has fully considered risks to childhood brain and behavioral development. We implored the EPA to assess the results of the six recent studies linking children’s pyrethroid exposures to brain and behavioral changes. Ultimate responsibility for protecting children from brain-damaging pesticides rests with one person: Scott Pruitt. So far, he has used his immense power not to protect kids, but to protect the interests of chemical agribusiness. If the EPA continues on this path, it would effectively derail the agency’s pesticide program. We hope we’re wrong. Pruitt could change course and begin taking seriously his job as chief advocate for environmental health and the safety of American children, before more kids are harmed for life by pesticides on their food. With nearly 4 million children born every year in the U.S., the stakes couldn’t be higher.